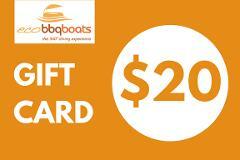 This $20 gift card can be redeemed for all online bookable Eco BBQ Boats products. This $30 gift card can be redeemed for all online bookable Eco BBQ Boats products. This $50 gift card can be redeemed for all online bookable Eco BBQ Boats products. 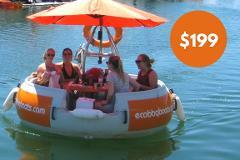 This $100 gift card can be redeemed for all online bookable Eco BBQ Boats products. This $150 gift card can be redeemed for all online bookable Eco BBQ Boats products. This $200 gift card can be redeemed for all online bookable Eco BBQ Boats products. 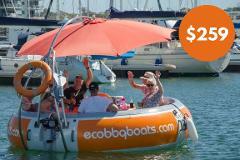 This $250 gift card can be redeemed for all online bookable Eco BBQ Boats products. This $300 gift card can be redeemed for all online bookable Eco BBQ Boats products. This is a special gift for a unique dining experience for up to 6 people with Eco BBQ Boats - an unforgettable and truly amazing adventure! This is a special gift for a unique dining experience for up to 10 people with Eco BBQ Boats - an unforgettable and truly amazing adventure!